Robot-assisted surgery has recently shown promise in terms of improving the accuracy of bone resections and of ligament balancing in unicompartmental knee arthroplasty (UKA). The goal is not to replace surgeons, rather improve their performance. Robot-assisted surgery has recently shown promise in terms of improving the accuracy of bone resections and of ligament balancing in unicompartmental knee arthroplasty (UKA) . The goal is not to replace surgeons, rather improve their performance. On the basis of numerous publications [2, 3], we have seen increasing use of systems consisting of an articulated robotic arm that works using data acquired by computed tomography (CT) prior to the intervention. The drawbacks of these systems are their size and the need for a pre-operative CT scan. 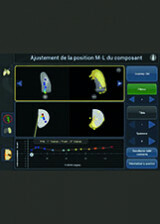 An advancement in robotic surgery has shown the development of a bone morphing step that takes place during surgery using the NAVIO system (Smith Nephew®) [4, 5]. This means that the pre-operative CT imaging is no longer needed. This article sets out the technical aspects of this development, as well as its current and potential applications. The patient is positioned in dorsal decubitus, using lateral and distal posts to hold the knee at 90°. An inflatable tourniquet may be fitted at the proximal thigh, depending on the surgeon’s usual practice.